pb blaster is childs play. Got a frozen bolt? I have the solution. Some say wd-40. Some say pb-blaster. I say screw that. Aerokroil is amazing. It's on a whole other level then those for freeing up frozen rusted bolts and nuts. The only downfall is its hard to find. The only place local I can find is at ace hardware. It can be bought online aswell. It's also alittle more expensive then pb blaster, but well worth it. Re: pb blaster is childs play. I hadn't heard of it either until I goty new job. I worked in a garage for five years without knowing bout it. I work on boilers now (lots of large nuts and bolts). Pb blaster barely helps at all. But the kroil works wonders. Just thought is share with yall. I've got a case in my own garage now and won't ever go back to pb. Machinist's Workshop magazine actually tested penetrants for break out torque on rusted nuts. Significant results! They are below, as forwarded by an ex-student and professional machinist, Bud Baker. They arranged a subjective test of all the popular penetrants with the control being the torque required to remove the nut from a "scientifically rusted" environment. 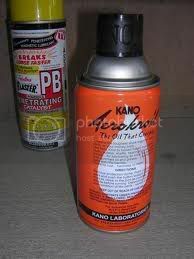 The ATF-Acetone mix was a "home brew" mix of 50 -50 automatic transmission fluid and acetone. Note the "home brew" was better than any commercial product in this one particular test. Our local machinist group mixed up a batch and we all now use it with equally good results. that stuff is AMAZING i got a few cans of it from where i used to work.... title of this thread says it all..
Nice! I'll have to keep that in mind and whenever I see a can of that Aerokroil I'll have to pick some up. LUCAS makes a penetrating spray called Tool Box Buddy, that we sell in my Parts Store, and when I worked for NAPA we had a product called S'OK that was raved about. Just sharing!